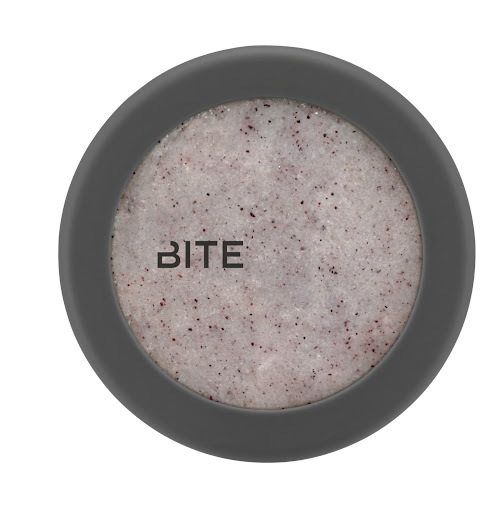 After perusing Sephora.com, I came across a new makeup line called BITE Beauty. With it’s sleek black packaging, BITE Beauty is a collection of lip products made from all natural and food grade ingredients that help improve the appearance of aging. BITE Beauty makes a good point: your lips age too, and it’s just as important to take care of them as well as the rest of your face. BITE Beauty’s secret weapon is Red Wine Resveratrol (a powerful antioxidant found in red wine) which is found in all of their products. A fun fact: each Bite lipstick has the antioxidant equivalent of five glasses of red wine. As a makeup artist, I am always on the lookout for new and innovative products that not only have lasting power, but are good for your skin. If you’re interested in trying Bite Beauty out, check out my top three picks below. 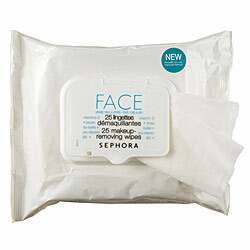 Right now this is only available via the Spring Cleaning Trio on the Sephora site. The Superfruit Butter contains concentrated whole superfruits for antioxidant age-repair. This all-natural butter is also scent-free. It comes in Acai, Blueberry, Cranberry and Pomegranate. “Use it on lips, cuticles – anywhere skin could benefit from a super boost of antioxidants and intensive conditioning.” YES PLEASE! This yummy vitamin gel is made with 5mg of vitamin C and 100% pure essential oils, helping to soften your lips, while the red wine Resveratrol improves your mood and smooths fine lines. Comes in Blood Orange, Ginger, Pink Grapefruit, Mint and Pineapple. This sounds weird but I would totally mix the Mint and Pineapple together! The holidays are approaching, ya’lll! 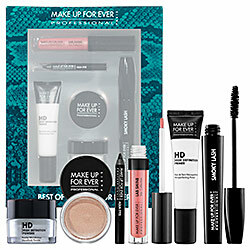 If you are looking for a gift for the Beauty Fashionista in your life, you have come to the right place. I compiled my gift favorites that Sephora is offering this season to make it easy for you. Nothing is worse than walking into a store and being bombarded with 500,000 gift sets and not having a clue about any of them! What’s great is that all these gifts are under $30! For the nail fiend in your life, Sephora recently started carrying British brand Nails, Inc. in their stores. Nails, Inc. is a high quality nail polish brand that I’m beginning to be a huge fan of. The Wyndham Collection features the Teal Black Kensington polish and The Wyndham Overglaze top coat, “which contains hand cut, irregular particles to create dramatic holographic effects when applied over other polishes.” I’m already swooning. 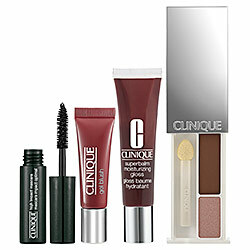 Clinique’s Black Honey Glow gift set includes the High Impact Mascara in Black, a limited edition Black Honey Gel Blush (LOVE), a moisturizing Super Balm gloss in Black Honey, and a shadow duo is Lucky Penny and Rose Chocolate. Flattering for all skin colors and YUMMY! 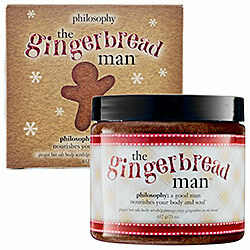 Philosophy’s set caught my eye when I read “Hot Salt.” According to the site, “the Gingerbread Man Hot Salt Scrub features sea salt and natural extracts to exfoliate and polish dry, rough skin, leaving it feeling silky soft, super smooth and conditioned.” I read the reviews and the salt actually heats up and gives you a tingly scrubby feeling all over. Yes, please! My heart palpitates when I think about this amazing little set from Fresh. This set includes a full size of their AMAZE BALLS Sugar lip balm in Plum, which is flattering for everyone. 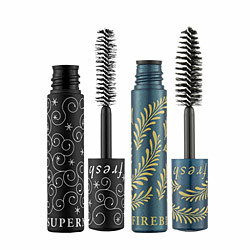 You also get small sizes of their SuperNova Mascara in Black, their Twilight Glow moisturizer (with red pearl, it’s gorge), and Soy Face Cleanser (great for sensitive skin). I wanted to share my thoughts on a poquito (sp?) little wax kit that was given to me by a friend to try. 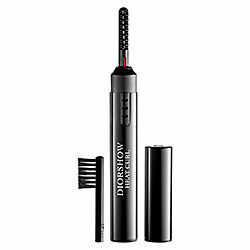 Anastasia is known for coming up with great tools and products for perfecting your eye brows. The Pro Wax Kit is an unbelievable $12 at Sephora. It’s third of an ounce of wax is easily microwavable and manageable. Surprisingly, this small amount of wax lasts quite a while. Contrary to its name, you don’t have to be a “pro” to use this. While I consider myself a connoisseur at plucking and trimming brows, I have never ventured into the wax arena and was a little nervous. However, the tiny little birchwood sticks the kit came with made it easy to control where the wax went, and how much of it went on my skin. 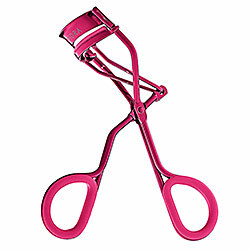 I use one muslin strip each time I have to wax my brows (about once every 3 weeks). You can use them over and over again in one sitting. I rubbed a little baby oil to the areas I waxed immediately after to help remove any stickyness and soften the skin, then finished off with a creamy moisturizer. Done and done. DISCLAIMER: when waxing, do not re-wax the same area -your skin will be highly sensitive and may form a rash from being so raw. Again, I am by no means an esthetician, but simply a Middle Eastern girl with facial and body hair expertise. Hi Bloggers! This is the companion video to my Gold Icon Look. I’m working on getting an HD video camera, so my apologies if it’s not top notch quality. Enjoy… and don’t forget to SUBSCRIBE! I am excited to share with you a plethora of beauty products that I recently got on my last (few) trip(s) to Sephora. I’ve recently started branching out and trying different brands. Most of my makeup career, I’ve relied heavily on MAC Cosmetics products, mostly because of my training there for 5 years and also because I get a SWEET discount with them. However, lately, I’ve felt a craving for more… variety. 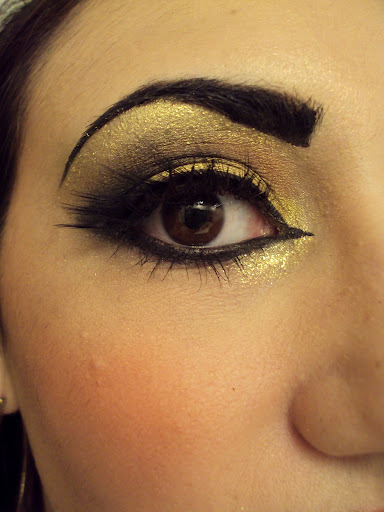 I mean, I can’t call myself a good makeup artist if I mainly use one line of cosmetics! This recent urge has taken me on many trips to Sephora and several beauty counters, as well as poring through Youtube tutorials and online reviews. Every waking moment I have had the last few weeks has been spent educating myself on all the different brands and TRYING everything! I feel like I have a whole new world at my fingertips, but also, like I am doomed because of course all of this is COSTLY up the wazoo. Anyway, below are my new findings and what I thought of them. I don’t know where this foundation has been all my life, but I am AS excited about this as I was about NSync in high school. For the first time in my life, I am applying foundation on with my fingers. 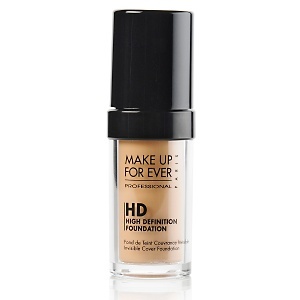 It glides on smoothly and gives beautiful coverage without feeling heavy. The color dries down true to what it looks like in the bottle, which is hard to find, as most foundations end up drying down darker than they look, or more yellow or pink. It looks gorgeous in photos as well as in person. Long-wearing and even a little sweat-proof. Once again, where on God’s green earth has this been all my life? I have always been very disappointed with the quality of eyebrow-filling products in the market, until this. I’ve tried everything: eyebrow waxes (too greasy), eyebrow liners (to harsh), eyebrow gels (crusty and pointless), and eyeshadow-as-eyebrow-filler (not strong enough). I hate when people’s eyebrows dissappear in photos because of the flash, or just look faded or even worse SHINY because of the product they put in them (mine included!). This silicone-based gel feels more like a cream and is applied with an angle brush. 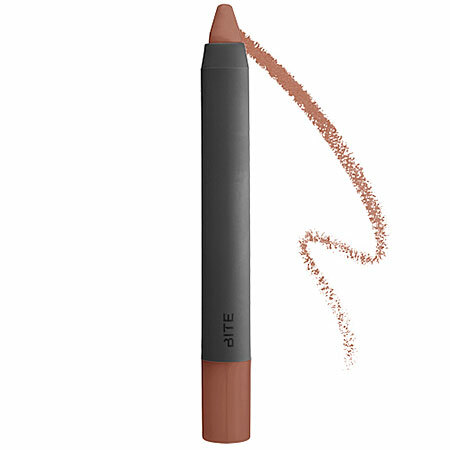 The color STAYS PUT (even through a workout at the gym), stays MATTE and stays SOLID. Washes off with soap and water. 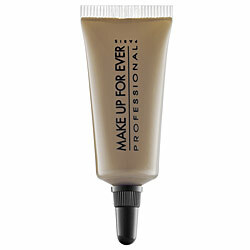 One tube will probably last you a lifetime, and no, I’m not joking. The only jest I have is that it only comes in 4 shades. I’m hoping they expand this line because it’s honestly amazing. Once again, I was trying not to break the bank, so I bought the sample-sized version of these two products in the checkout line of Sephora. The Freshface Primer smells amazing (like roses!) and a tiny bit does go a long way. I’m not sure if it’s worth the hefty price though ($36) , since there are so many other primers that are cheaper and can do the job just fine. 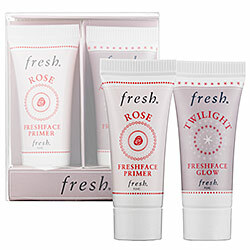 The Freshface Glow ($36) is a moisturizer with a red pearl glow. 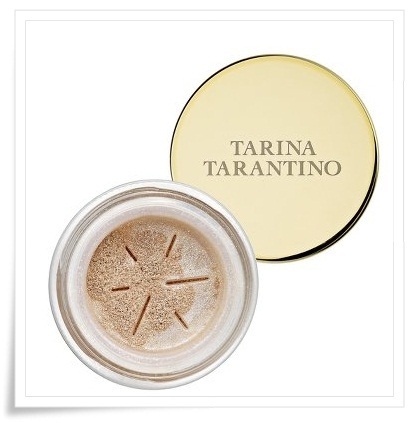 It’s really gorgeous, but reminds me of MAC’s Strobe Cream ($29), which is slightly cheaper. My thoughts? If you got the $$ go for it. If not, there are cheaper options. What…an utter dissappointment. I jumped at the price– 25 wipes for eight bucks!– but gravely regretted it later. First of all, the wipes feel like they are SOAKED in Palm Olive. Secondly, it didn’t remove jack sh*t. After using one wipe, I looked like Heath Ledger’s The Joker. I still had to wash off the remainder of my makeup with my Philosophy Purity cleanser and warm water. I still stand strongly by MAC’s wipes (45 for $18).